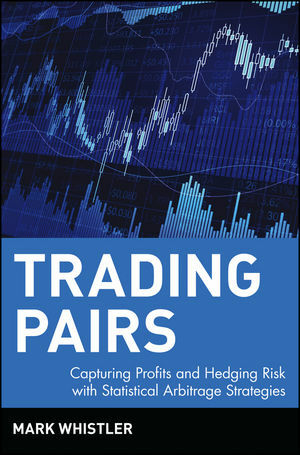 A leading arbitrage expert gives traders real tools for using pairs trading, including customizable Excel worksheets available on the companion website. Mark Whistler (Denver, CO) is the key developer of pairstrader.com as well as a licensed securities trader and broker and leading arbitrage expert. Mark Whistler is a licensed securities trader and broker and leading arbitrage expert. Mark recently worked as the Editor in Chief for a respected financial newsletter and was a guest analyst on a nationally syndicated radio show. He holds a bachelor’s degree in finance and art history. He is the key developer of pairstrader.com and can be seen around the country giving seminars on trading techniques, technical analysis, pairs trading, and deciphering economic news. He has contributed to a market show on 760 AM (in the Denver area), and writes a newsletter, The Pairs Trader (pairstrader.com). CHAPTER 1:The Nuts and Bolts. Mindset of Reading This Book. CHAPTER 2: Why Fundamental Analysis? How Fundamental Analysis Relates to Pairs. Growth, PE, and the PEG Ratio. CHAPTER 5: Technical Analysis Indicators. CHAPTER 6: Basic Pairs Terminology. CHAPTER 7: Importing Data into Excel. CHAPTER 8: Understanding Correlations—Steve Price. Building a Correlation Using Excel. CHAPTER 10: Understanding Stock Correlations in Relation to Indices. CHAPTER 12: Excel and Statistics. Average, Median, Mode, and Standard Deviation. How Do You Know Which Stock to Buy or Short? CHAPTER 13: Differential versus Ratio. CHAPTER 14: Applying Statistics to Pairs. CHAPTER 15: Taking a Step Back for a Moment. CHAPTER 16: Moving Averages and Normalized Standard Deviation. Understanding How Pairs Can Be Dangerous. CHAPTER 18 Money Management II. CHAPTER 19: The Reality of Pairs. Making the Style Work for You. CHAPTER 20: Trading an Actual Pair. Historical Time Line of Divergence Events. CHAPTER 21: The Current Setup. Understanding Where the Pair Is Now. CHAPTER 23: Correlating Stocks to Indices. General Electric and the DIAMONDS. CHAPTER 24: Option Basics—Scott P. Evans. Volatility Position Sizing in Your Spreadsheet. Volatility and the Individual Stock. CHAPTER 26: Understanding Volatility and Options. CHAPTER 27: Using Technical and Fundamental Analysis with Pairs. KBH Homes and Tol Brothers. Moving Averages and Support and Resistance as Stops. CHAPTER 28: Assorted Advice to Assist Trading. CHAPTER 29: The Monitor Sheet. Appendix I Economic Indicator Summary. Appendix II Web sites, Books, and Software. Glossary—Jonathan Crowell and with Additions from Andrew and Aaron Long.